Maybe marketing major Mikaella dela Pena wasn't exactly who the selection committee envisioned when they sent email to the graduating class seeking applicants for the student speaker at Indiana State University's winter commencement. "I opened the email and laughed, because I'm a very non-traditional student with an academic career that has been a little different than most," she said. "I forwarded the email to my mom and a couple of friends and laughed about how I just didn't fit the profile of your typical graduation speaker. I joked that I should apply, but they all asked why I wouldn't." The answer seemed simple. Because a once above-average student at Ben Davis High School in Indianapolis, dela Pena had hit more roadblocks to a college degree than she could have ever imagined. In spite of all of the headwinds she's battled, dela Pena pecked out an email request to see an application, which she received in record time from Lisa McDaniel in the Division of Student Affairs. She glanced over the requirements and promptly put it out of her mind. Until two days before the deadline. "Lisa McDaniel emailed me and said she hadn't heard from me since I asked for the application, which she reminded me was due in two days," dela Pena said. "For some reason, I stopped what I was doing and wrote my graduation speech. I have always been a good writer, and it only took about 30 minutes." Two days later, dela Pena learned her application had catapulted her to the next round in the process. "I hadn't thought that far ahead, and in the final round, I had to deliver my speech to a panel of six or seven people. That was on a Thursday, and they said I would find something out by Monday, but less than 24 hours later, they called me and said I was the commencement speaker," she said. "I had actually told my mom that I did not want to walk at commencement, but it was a nice surprise to be able to tell her two months later that not only would I be walking but, oh, by the way, I'll be giving the commencement speech." That's a long ways away from where the transfer student from Indiana University-Bloomington imagined herself when she arrived at Indiana State to start her sophomore year. "My year at IU was actually the best grades I had ever gotten, but I wasn't adjusting well to the big campus and I missed my mom, who had moved to Terre Haute after getting married," dela Pena said. "It's just me and my mom here in Indiana, and she reminded me that she had just moved to Terre Haute and Indiana State University is there. She suggested that I transfer to be closer to her." Despite a relatively smooth transition to State, dela Pena longed for independence and quickly moved out of her parents' house to discover what all adults learn - moving out on her own meant much emptier pockets. She had always worked full-time throughout school, but when she didn't have the funds to clear the balance she owed and couldn't register for classes, dela Pena took her first break from school. She left Indiana State for only one semester, then returned for a year before taking another two semesters off. "Two years ago when I took my first break, I told myself I didn't want to come back. I wanted to travel and was struggling to find my place at ISU, but it only took me about two months to change my mind," she said. "It's not that I think having a degree makes you a better person, but my world suddenly got really small once I realized I wouldn't be getting my degree. I didn't like that idea, so I came back before taking a year off for financial reasons." While she juggles a class schedule and two jobs, one waiting tables at Red Lobster and another working the register at Fresh Thyme, it's a more moderate pace than the 24-year-old experienced many times during her journey to the speaker's podium at graduation. "There have been times I've worked three jobs at once, which is why I do most of my education online even though I live five minutes away," dela Pena said. "I wasn't really heavily involved in a lot of clubs during college, not because I didn't want to be, but because of time. I have one evening, in-person class this semester and it's probably the first time I've sat in a classroom in two years. I don't know where a lot of the buildings are on campus, but Federal Hall is ISU to me." Maybe this wasn't how her college years would have played out in a perfect world, but dela Pena embraces her struggles, is proud of overcoming her setbacks and is excited for what lies ahead, including a trip to Tokyo in February - her gift to herself for finishing her degree - and then to the Philippines where she was born. "When I get back, my lease here is up in July and I promised myself I would not renew it, so I'll be hitting the job applications and figuring out where I want to go. Luckily, I'm not very picky and have been looking for social media marketing jobs in places from Portland, Ore., to Boston," she said. "If I had had an easier journey, I wouldn't be as prepared for what happens after graduation. A lot of people are scared about the next step, but I'm not at all. I'm excited." As it turns out, the words of a sixth-year senior, mostly online student who left school twice might be just the reassurance the Class of 2016 needs before stepping out into the world. "The moment I realized I wouldn't be graduating in four years I felt ashamed until I realized that that's not what college is about," dela Pena said. "I want everyone to be proud of themselves and their journey come December, even if it took a little longer than most to get here. It's a tortoise and the hare type of story. It doesn't matter how long it takes you, just as long as you get there." Indiana State's winter commencement ceremony will be held at 11:45 a.m. Saturday, Dec. 17 in the Hulman Center. 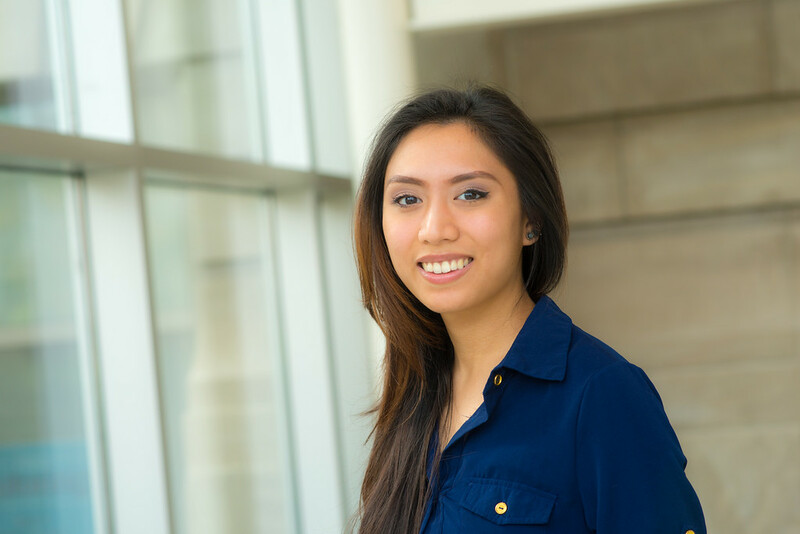 Senior marketing major Mikaella dela Pena will serve as the student speaker during winter commencement at 11:45 a.m. Saturday, Dec. 17 in the Hulman Center.